During the questioning phase of Betsy DeVos’s Senate confirmation process for U.S. Secretary of Education, DeVos, a “school choice” advocate, demonstrated a lack of knowledge about, and a lack of commitment to, enforcing the Individuals with Disabilities Education Act (IDEA) -- the law that requires schools to provide a free, appropriate education for students with disabilities. DeVos's ignorance about IDEA has caused many individuals with disabilities and their families to become very concerned about their or their family member’s access to public education, and understandably and rightfully so. Individuals with disabilities and their families rely on robust implementation of laws like IDEA for equal educational opportunities. Stemming from this concern are calls from some to pull children with disabilities out of public education, and then homeschool them. I, and many other advocates who are concerned about equal educational opportunity for students with disabilities, have some concerns about removing students with disabilities from the public education system. There are devastating financial implications of removing students with and without disabilities from the public school system. According to the National Center for Education Statistics (NCES), the Department of Education spent $12,296 per student enrolled in public education in the 2012/2013 school year. Some of that money was spent on expenses directly associated with educating the individual student, and some of it was spent on shared expenses of educating all students like school building maintenance, staff and faculty salaries, etc. Again according to NCES, 12.9% of all students enrolled in public schools in the 2014/2015 academic year were students with disabilities who were supported by special education programs. If even half of all students with disabilities who received special education services were withdrawn from public schools, public schools would lose 6.45% of their funding. This will have devastating impacts for already underfunded schools, and compound their existing racial and economic disparities. And many low-income families can’t afford to take their children out of schools and homeschool them -- the parents have to work, and also may rely on the schools' free and reduced-cost meal programs. As an autistic person who was withdrawn from the public school system and homeschooled because my public elementary school wouldn’t give me the accommodations I needed, I can understand parents' impulse to want to protect children with disabilities from repeating my experience now that DeVos is in charge of the Department of Education. While I was involved in the decision to withdraw me from public schools after the fifth grade, and did benefit from some parts of homeschooling, in hindsight, I wish I had continued with public education. I left the public school system thinking, “Public school isn’t for me. I don’t belong there.” which is a devastating thought for any child to have. 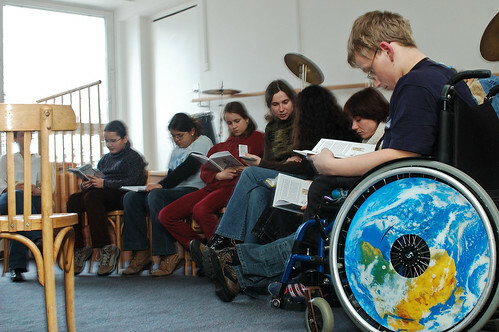 Every child, including LGBTQ children, children with disabilities, immigrant/refugee children, Muslim/Jewish children, and children of color, has the right to a public school education, and has just as much of place in public schools as their straight, cisgender, white, Christian peers without disabilities do. Why don’t we all stick together and fight to ensure that every public school is safe and inclusive for all, including students with disabilities? For those who are privileged to even think about homeschooling your children, why not become active with your school board instead either as a citizen or a member of one? How about being active with your school’s PTA or with a local advocacy organization that advocates for safe, inclusive schools? Why not spend your time contacting your elected officials, and urge them to support safe, inclusive public education? Why not advocate for the things we appreciate in homeschools and private schools to be available to all in public schools?